Objectives – The program of this diagnostic masterclass is adapted to the needs of the multidisciplinary tumor board in the era of mammography screening, early detection of breast carcinomas, precision surgery, and targeted oncological therapy. 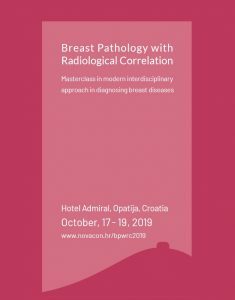 The recent advances in modern breast imaging represent a challenge for pathologist to fulfil the requirements for detailed and systematic radiological – pathological correlation and to provide correct morphological background for interdisciplinary diagnosis and therapeutic decision-making. This masterclass aims to facilitate better understanding of breast diseases and improved communication between the members of the breast team in order to avoid misinterpretation of the findings, under- or over-diagnosis and to assure adequate treatment of the individual patient. The program is partly based on that of previous masterclasses and that of the breast pathology arm of the European School of Pathology and comprise presentations of related theories and practical issues, case demonstrations with radiological correlation, as well as analysis of large format digital histological slides. • The role of molecular methods in diagnosing breast diseases. This masterclass is designed for the members of the breast team: practicing pathologists, radiologists, surgeons, and oncologists, both specialists and trainees. DOGAĐAJI, VESTI dusan bunovic 12. априла 2019.